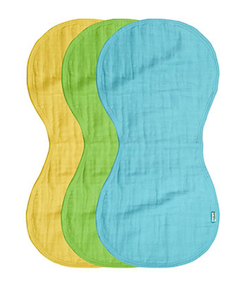 Baby's skin will feel soft and smooth next to organically grown cotton Muslin Burp Cloths. Four absorbent, thick and thirsty layers are generously sized to absorb dribbles, and yet breathable to keep baby cozy, dry, and comfy. Super soft, gets softer with every wash. Generously sized.